We hope you’ll join us on Saturday, April 7, for an exciting day! We’re fortunate to be working with two first-class guest artists this year, oboist Johanna Cox Pennington (Louisiana State University), and Kristin Wolfe Jensen (University of Texas). 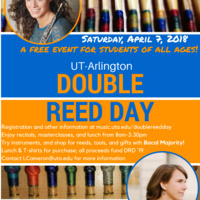 Both artists will give masterclasses, and other classes will be available on the topics of college preparation, reedmaking, and recording techniques! Other faculty will give performances, as well, including Prof. Rogene Russell (oboe), Dr. Laura Bennett Cameron (bassoon), Sarah Highland (bassoon), joined by pianist Gabriel Sánchez. Bocal Majority will be on hand with tools, reeds, cane, supplies, gifts, and instruments to try! Registration begins at 8am, and first event is the Guest Artist Recital is at 9am in Irons Hall. Parents are invited to stay for the opening recital, to hear the inspiring artists who will spend the day with your students. There is also a 10AM Parent Info Session with Dr. Chris Evans, our Associate Director of Bands, who will have information for you about how a parent and student can prepare for a potential music major in college. Lunch will be for sale from the Maverick Bassoon Club, or students are welcome to bring a sack lunch. Double Reed Day T-shirts will also be for sale! The closing recital is at 2 p.m. and will feature faculty solos, chamber music, and your students in a double reed choir! A reception to follow the recital. The event will take place in the Fine Arts Building, on the east corner of Nedderman and Greek Row Drive in Arlington. Please park in one of the many lots surrounding the Fine Arts Building, in any spot that is not dedicated as being reserved 24 hours a day. The Music Department entrance is on the south end of the building, past a courtyard with a small circle drive, picnic tables, and trees, to your right (but before you go up the stairs). Registration will be just inside that door. Participants will not need to bring music or anything special, just instruments, reeds, reed soaker, seat strap - the normal things they need for playing. If you would like to purchase lunch, t-shirts, or products from the vendors, please bring a credit card or cash.